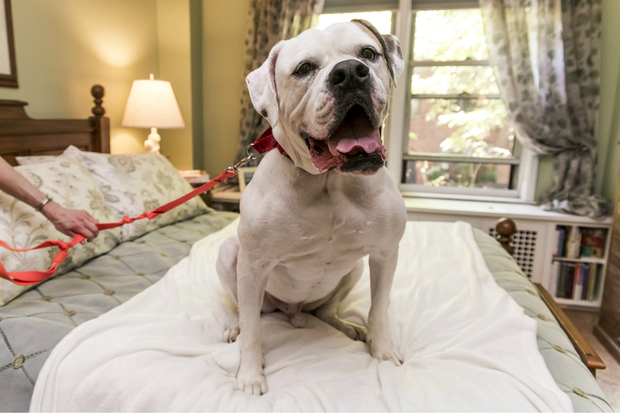 UPPER EAST SIDE — At 103 pounds, Kiki is a big boy who will "perk right up and dance along" with anyone who is excited to see him, according to his caretakers at the ASPCA Adoption Center on East 92nd Street. But the 4-year-old American bulldog wasn't always so happy. Kiki has overcome much since he came to the ASPCA. He was a victim of animal cruelty and as a result suffered from various medical problems, according to Trevor Simms, the lead animal care technician at the center. "He originally came to the ASPCA in 2012, after not being treated the way he deserved," he said. "Since then, he’s faced a series of unfortunate circumstances and has been back and forth from our Adoption Center a few times through no fault of his own. He hasn’t let his past trample his happy-go-lucky attitude — he’s still waiting for his perfect family to find him and take him home." Now, he's healthy and happy, and knows a slew of tricks like how to sit, lay down, and give his paw. "Kiki is a special dog and you can’t help but smile when you’re around him," Simms said. "You can’t help but laugh at his goofy personality, and his funny way of galloping around as if he doesn’t know his own size." Simms recommends a home where he can be the one and only hound in the house with kids ages 10 and older. Kiki is one of several large dogs who need a forever home, according to Joey Teixeira, the manager of client relations at the ASPCA. Bigger dogs aren't as easily adoptable because people tend to think they'd be too much trouble, he said. "We often hear from apartment dwellers that they don’t think they have space for a big dog in their life, or that they think it wouldn’t be fair to have a big dog in a small home. This isn’t the case," Teixeira said. "A big dog can be just as happy lounging on the couch with you as their smaller counterparts. All dogs — big and small — need appropriate exercise outside the home, so we like to say ‘It’s not the size of your home that matters, it’s the size of your heart,'" he continued. To give the bigger dogs a better chance of getting adopted, the ASPCA is holding a "Big Love" promotion during the month of October. All dogs over 30 pounds will have their weight subtracted from the standard adoption fee ($75), meaning the bigger the dog, the bigger the savings. That also means that Kiki — who is fully vaccinated, neutered and microchipped — would be free to adopt. "Kiki is definitely a staff favorite and we would all be thrilled to see him walk through those front doors with a loving family," Simms said. To adopt Kiki, call the adoption center at 212-876-7700, ext. 4120. Profiles of all the center's adoptable dogs can be found on the ASPCA's website.